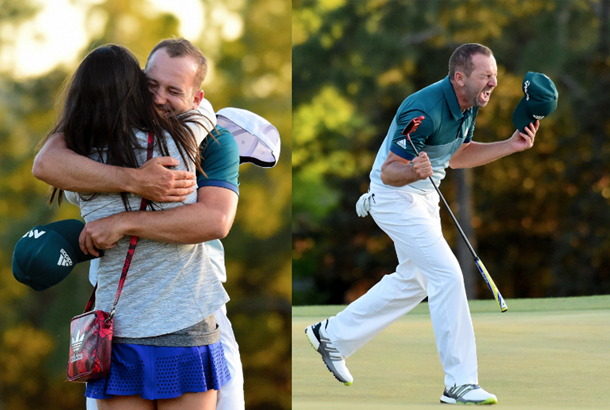 On April 9, 2017, playing in his 74th Major Championship, Sergio Garcia finally got the monkey off his back and won the Masters on the first sudden-death play-off hole against Justin Rose. Heading into Masters Sunday with a tie for the lead, what was going through your head on Saturday night? Saturday was when I was a little bit more nervous than any other time. I knew how important it was going to be. I've been in a good position heading into Saturday several times before and many of them have got away from me. So after I shot two- under in the third round and I was still tied for the lead, I was happy. I was comfortable, I was pumped, I was committed and I was calm. I'd been playing great all week and was just really, really excited to get into Sunday, believing in my ability to go out there and do what I knew I could do. It's quite simple. How important was it to start strongly on Sunday? It's always important to start well on Sunday when you have the lead or you're tied for the lead. But the most important thing was how I felt. Calm and comfortable – even when I missed a short birdie putt on two and missed birdie putts on eight and nine, I was fine. I just kept thinking 'you're playing great, feeling great, just don't worry about it. Keep giving yourself chances and the putts will drop.' So starting well was obviously important, but that start came because of the way I felt and where my head was heading into that round. After Rose bogeyed the fifth, you had a three-shot lead. 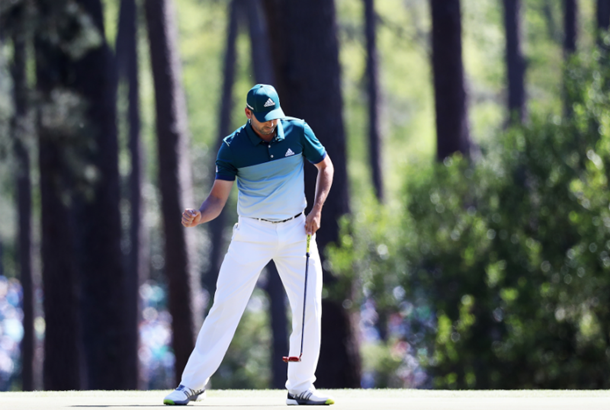 How were you able to maintain your focus, knowing you had a significant lead at the Masters? Sunday at any Major is long, and at Augusta it's even longer. You know the course is asking you to be very precise – and if you're not, you can make bogeys quite easily. But if you are precise, you can make a good amount of birdies. The way they set up some of the pins on Sunday, you can get a lot of birdie opportunities. You could get to seven and even make a two if you hit a really good shot, you could make a three or four on eight because it was a front pin, on 13 you could make birdie or eagle with a good drive, 14 was a good pin because if you hit a good shot, everything funnelled to the hole, and 15 and 16 are also holes where you can make something happen. So I knew there were a lot of opportunities coming up and I just kept telling myself to stay calm, stay in the moment, and believe that I could do it. When Justin hit back with three straight birdies, did you start to feel any additional pressure? He was hitting the ball great and, though he missed a couple of opportunities early on, I knew he could get going any moment. But at the same time, I felt that I could do the same. So heading into 10, I wasn't feeling any additional pressure, even with Rosey's three birdies in a row. The way I was playing, I was still feeling really good–I won't lie, I'd have loved to have had a three or four- shot lead going into 10, but I knew we still had a lot of golf left. The only moment where I felt a little uncomfortable was on the 10th because it's a hole where you have to turn it quite a lot from right to left, and that's not my most comfortable shot. I'm more of a fader. Even after I made the bogey on 10 I was still feeling fine. Then I got to 11 – I didn't hit that a bad drive, I just pulled just a little and it took a big hop on the rm fairway into the pine straw. I ended up making a bogey, but I still felt fine. So where was your head on 12, now you're trailing by two? I was thinking 'you're only two shots behind. You need to hit a good shot here and be sure you make a three, at worse'. I knew from 13 onwards, if I kept playing well, a lot of good things could happen. We've all seen it through the years – guys making birdies on four or five holes coming in or a couple of eagles, so I knew it wasn't going to be a problem. After those two bogeys, the most important thing was to hit a solid shot on 12. Don't get stupid and start thinking 'I need to birdie this hole'. There are other holes that you can birdie that are not going to get you into the kind of trouble you can find yourself in on 12! I could walk away with a par and not lose much ground. I had to be patient and wait to make a move on the final six holes. After taking an unplayable on 13 and making a clutch par, how much did that energise you going down the final stretch? That par on 13 was important for a couple of reasons. Firstly, I didn't hit that bad a drive, but it caught a tree – and when it hits a tree you never know where it's going to bounce. It could've bounced into the fairway or into the creek, but mine bounced into the bush on the other side of the hazard. The good thing about it was that where I was able to drop the ball, I could advance it quite close to the green. And since I was playing well, I knew that I could get it up and down from 80-90 yards. The most important thing for me about making the putt on 13 was that it got me back to feeling like I can make big putts. I missed a putt on eight, I missed a putt on nine for birdie, and I missed another par putt on 11, so it was good to make a putt at the right time to get myself going again. To see the ball rolling in, to get that feeling... it gave me confidence to go into the final five holes knowing I still had a legitimate chance to win. Not only was making par great, because it showed character and resilience but, at the same time, it gave me the energised feeling I needed to go into the final holes. Talk us through what happened over those four holes. On 14, I hit a nice drive and followed it up with a three-quarter 9-iron to about five feet. I made a nice downhill right-to-left putt for birdie. On 15, I hit a GREAT drive. I was hitting the ball so well all week, but on Sunday, for some reason, I was hitting it really flush with the driver. I was hitting it quite far as well. The fairways were firming up by that time and I hit a really good drive down the middle, leaving me about 188 into the par 5. Being a little downhill and a little down breeze, it was a perfect hard 8-iron for me. It hit it exactly how I wanted. It came out dead straight, right at the flag. I thought 'please, just be right!' I knew if it was right, it was going to be close. I didn't know it was going to bounce that close, but the line was perfect. It ended up landing about four inches short of the hole, glanced the pin on the bounce, and ricocheted to the left to about 12 feet. Looking at it after the round, it was probably a good break because it left me a little longer putt, but it was straight up the hill and a tiny bit left to right. If I'd missed the flag, I probably would've had a six-foot putt, but it would've been a really fast, big breaker. It was your first eagle at Augusta in 452 holes – at such a crucial time. How did it feel? The putt fell in almost on the last revolution. The energy and the excitement that I felt – not only from making the putt, but from what the people showed me on that hole – was just amazing. Even after Justin made his birdie and I missed mine, I knew I could birdie one or both of the final two holes and win. But after Justin made bogey on 17, I found myself standing on the 18th tee with a share of the lead. I've been on that tee many, many times and there have definitely been times when I've been uncomfortable there. But with the way I felt that week and the way I'd been swinging all week, I felt very comfortable in that moment. I stood there looking at the tee shot just thinking 'this is perfect'. I aimed for the middle right of the fairway bunker and just let it slide a little bit with a fade. My adrenaline must've been pumping because I hit a huge drive and only had wedge into the green. Rosey hit a great drive too, leaving him with an 8- or 9-iron. I was really enjoying the moment, so I didn't have time to feel nervous or doubt myself – I just told myself to keep doing the same thing I had been doing up until that point. On the green, I was thinking Rosey was going to make his putt. He'd make it and I would need to make mine to send it to a play-off. Once he missed, I was thinking, 'OK, now we have a free go at it. Just make this putt and the tournament is over.' The putt I had was probably about a five-footer down the hill. I actually had a similar putt during one of the practice rounds that I tested a couple of times. I remember both times, the ball moved an inch or two to the left. So once I saw that putt, I thought I was in a perfect situation. There's no secret to this putt. I didn't want to ask my caddie for a read or anything, because I had the image of the putt so clear in my head and I didn't want to have any doubts in my mind. Right edge. Stick to your routine. Make a good stroke. I hit a good putt. After Justin hit his drive into the trees, what did you feel you needed to do to win? From the moment I got in the cart to head back to the 18th tee, I was thinking 'I need to birdie this first play-off hole. No matter what he does, I need to birdie it'. If you step up to the tee with the frame of mind to win with a par, your swing is not going to be as aggressive – I wanted to be aggressive. I wanted to be confident. That's how I was playing all day and I didn't want to change that. In my mind, even when he hit it right... even after he was forced to chip out, I still told myself I needed to make birdie. He could still make four from there, so I needed to make three. Walk us through the moment your birdie putt went in. I hit a really nice three-quarter 9-iron to about 10-12 feet. Once Justin missed his par putt, I knew I could win with a four. But I still wanted to hit a good putt and give it a chance at going in. Obviously, I didn't want to run it four or five feet past, but I still wanted to hit a solid putt. When the ball went in... I don't know. It was just a mix of thoughts, emotions, joy, memories of the past from when I was little, great moments as a professional, bad moments as a professional, thoughts of my family, of my (then) fiance, of her family, my whole team... everything coming together all at once. I just started screaming. It was probably the hardest I've ever screamed for that long. I ended up losing my voice for the next couple of days. But at the same time, just like on 15, to see the joy of the people, to see how happy they were, and to hear them chanting "Ser-gi-o! Ser-gi-o! Ser-gi-o!" To hear that and feel the joy of the people, to realise how happy everybody was to see me finally come through and win a Major – win the Masters! – it was amazing. I'm not a crier, but I had a couple tears running down my cheeks in that moment. It was very emotional. Very beautiful. What does it mean that you're a Masters champion for life? After the Masters, we spent a lot of time in Switzerland just relaxing and soaking everything in. Once in a while, I'll look at Angela and I'm just like: "We won the Masters." Sometimes you have to remind yourself that you've done it. Now that I've won it, we get to go back every year until we can't walk anymore. That's not something a lot of people have the chance to do. There's so much history. It's unreal. What can we expect to see on the Champion's Dinner menu? It's going to be Hispanic. One of my favourite dishes we have in Spain. It's going to be very tasty! What did it mean to you to be competing against Justin? Justin and I have been friends for a long time. We've been on Ryder Cups together, we played a lot of amateur golf together, so it was great not only to be paired with him, but for both of us to play that well and push each other's limits. We were trying to beat each other, but we tried to do it with a lot of respect – the way it should be done. Golf is a sport of gentlemen. You have to respect each other. To win a tournament or win a major, you should do it by playing great, by playing hard, and by playing better than the other guy... not by using gamesmanship. 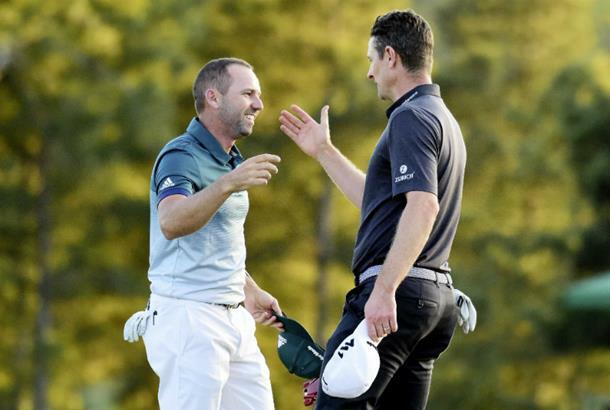 What did you say to each other after you holed your putt? We hugged, he leaned in and said something very nice: "If anybody deserved this, it was you. I'm so happy for you." What was the most critical club in your bag that week? Usually, when you win, every part of your game is usually on. To win a Major, every part of your game has to be at its very best. But at Augusta, I had one of the best driving weeks of my life. I only had two or three bad drives all week. My iron play was strong, my chipping was solid and I was con dent with my putting. My lag putts lacked a little speed here and there, but my putting inside seven to eight feet was some of the best I've had in a long time. I made so many good par putts when I had to and a couple of birdie putts at the right time to keep my round going. Do you think there is more or less pressure on you to win another? I've always felt like the first one is the toughest. Winning the Masters has shown me that I can win Majors, so why not do it again?